DIE Sabbati, 12 die Januarii. Message to H. C. with it; --and with Scawen's, and the Bill to illegitimate Ly. Roos's Children. Report of the Conference on the Bill to prohibit the Importation of Irish Cattle. Report of the Conference on the Bill for examining Public Accompts. Message from H. C. for a Conference on the Poll Bill. Rating of Peers to be considered. L. Morley, Privilege. Hastings discharged. Upon Report of the Committee for the Bill for erecting a Court of Judicature for deciding of Differences touching Houses burned or demolished by reason of the late Fire in London, "That their Lordships do want the Assistance of some of the Judges and Mr. Attorney General:"
It is ORDERED, That the Lord Chief Justice of the King's Bench, Judge Tyrrell, and Mr. Attorney General, have Notice to attend the said Committee on Monday next, in the Afternoon, at Three a Clock; and at such other Times as the Committee shall appoint. Hodie 3a vice lecta est Billa, "An Act for the Illegitimation of the Children of the Lady Anne Ross." The Earl of Dorsett reported, "That the Committee have considered of the Bill to prevent Theft and Rapine upon the Northern Borders of England; and they think it fit to pass as it is, without any Amendment." Hodie 3a vice lecta est Billa, "An Act to continue a former Act for preventing of Theft and Rapine upon the Northern Borders of England." 1. To let them know, that the Lords have passed the Bill for preventing Theft and Rapine upon the Northern Borders, without any Alteration. 1. The Bill for restoring in Blood Francis Scawen. 2. The Bill for Illegitimation of the Children of the Lady Anne Ross. Next, the Earl of Anglesey reported the Effect of the late Free Conference with the House of Commons, concerning the Bill against importing of Irish Cattle, &c.
He said, "That Sir Robert Howard said, That concerning the Word ["altogether"], which the Commons forgot to give their Lordships an Answer in, the Commons do agree for the leaving of it out of the Bill. "He further said, That the only Word in Difference now between the Houses was the Word ["Nuisance"], which the Commons adhere to. The Commons take Notice of their Lordships Petition presented to the King, wherein there is an Expression, that this Bill would be ineffectual in case His Majesty grants any License or Dispensation; which furnisheth them with a Reason to insist upon the Word ["Nuisance"], which would take away all Power of dispensing in the King. "1. Because it admits the Thing dispensable in its own Nature; which the Commons deny. "2. It argues a greater Distrust of the King than they allow. "3. Because this Way of petitioning the King is totally without Precedent." "That this Proceeding of the Lords, in going by a Petition to the King for a Commission for taking the Public Accompts, there being a Bill sent up from the House of Commons, and depending before the Lords, for taking the said Accompts in another Way, is unparliamentary, and of dangerous Consequence. "1. Because that, according to the Right and settled Course of Parliament upon Bills, neither a Bill nor any Part thereof is to be communicated to His Majesty by either House, until the Whole be agreed by both Houses. "2. This Way of Proceeding imposeth upon, and takes away, the Freedom of Debate and Resolution in the Houses of Parliament, and betwixt the said Houses. "3. This Way of Proceeding doth directly tend to the destroying of the due Correspondence of the Two Houses each with other in passing of Bills, and that which ought afterwards to be from the Two Houses to His Majesty. "4. By this Way of Proceeding, His Majesty will give His Answers not in the Presence of the House of Commons, according to the Course of Parliament, concerning Matters contained in Bills relating to the whole Realm. "5. This Way of Proceeding is without Precedent; and this Reason only was by the Lords offered as sufficient why the House of Lords lately refused to agree with the Commons in taking of these very Accompts by a Way proposed by the House of Commons. "Therefore the House of Commons desire the Lords to proceed upon the Bill for the Public Accompts." The House began a Debate concerning this Report; and ORDERED, That the further Debate of this Business shall be resumed on Monday Morning next, the First Business. To desire a Conference, concerning the Subject Matter of the Poll Bill. That this House will give a present Conference, in the Painted Chamber, by a Committee of both Houses, concerning the Subject-matter of the Poll Bill. The same Lords are to report this Conference as managed the late Conference with the House of Commons concerning the Matter of the Poll Bill. 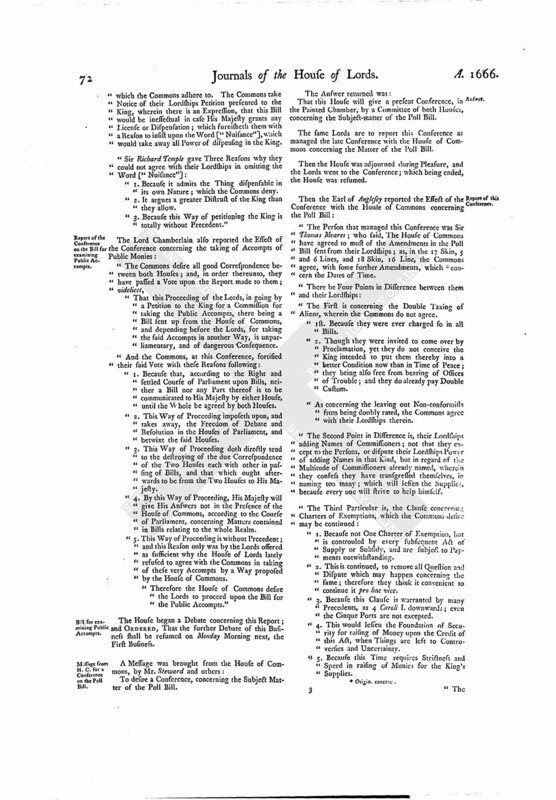 "The Person that managed this Conference was Sir Thomas Meares; who said, The House of Commons have agreed to most of the Amendments in the Poll Bill sent from their Lordships; as, in the 17 Skin, 5 and 6 Lines, and 18 Skin, 16 Line, the Commons agree, with some further Amendments, which (fn. 1) concern the Dates of Time. "The First is concerning the Double Taxing of Aliens, wherein the Commons do not agree. "1st. Because they were ever charged so in all Bills. "2. Though they were invited to come over by Proclamation, yet they do not conceive the King intended to put them thereby into a better Condition now than in Time of Peace; they being also free from bearing of Offices of Trouble; and they do already pay Double Custom. "As concerning the leaving out Non-conformists from being doubly rated, the Commons agree with their Lordships therein. 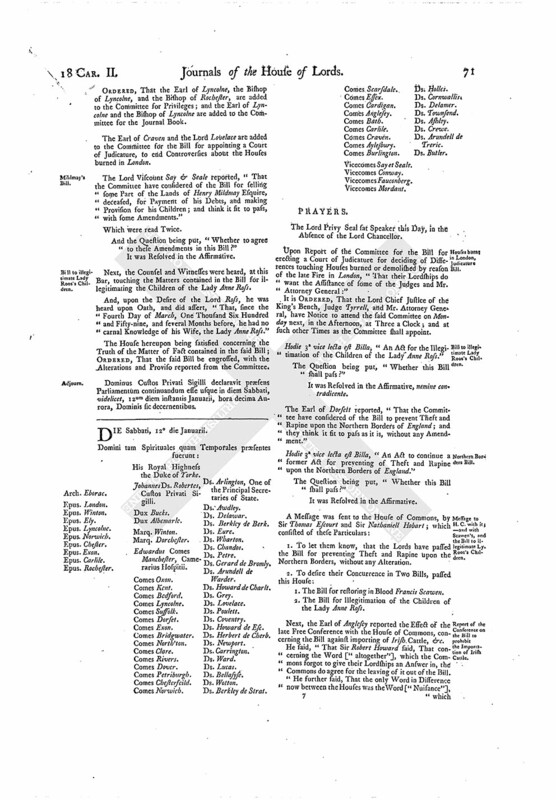 "The Second Point in Difference is, their Lordships adding Names of Commissioners; not that they except to the Persons, or dispute their Lordships Power of adding Names in that Kind, but in regard of the Multitude of Commissioners already named, wherein they confess they have transgressed themselves, in naming too many; which will lessen the Supplies, because every one will strive to help himself. "1. Because not One Charter of Exemption, but is controuled by every subsequent Act of Supply or Subsidy, and are subject to Payments notwithstanding. "2. This is continued, to remove all Question and Dispute which may happen concerning the same; therefore they think it convenient to continue it pro hac vice. "3. Because this Clause is warranted by many Precedents, as 4 Caroli 1. downwards; even the Cinque Ports are not excepted. "4. This would lessen the Foundation of Security for raising of Money upon the Credit of this Act, when Things are left to Controversies and Uncertainty. "5. Because this Time requires Strictness and Speed in raising of Monies for the King's Supplies. "1. Because, searching the Rolls of Parliament (though this be a Time unseasonable for making of Questions), it cannot be thus amended as their Lordships propound, by no Precedent whatsoever; as the Aid of 13 E. III, and 12 E. IV, Precedents clogged with Conditions, are ill Precedents, but do not warrant this Way of their Lordships. The Lords and Commons differed in the Kind of Tax. But where the Tax was one and the same, they say they are to seek for Precedents in this Case, that the Lords granted distinctly by themselves. If they should send up a Bill without taxing the Lords, they might be taxed alone by their Lordships. "2. Because a Poll Bill was never sent up with Blanks; and they say, they do not charge your Lordships, but propose, which you apart may alter and change as you please. "3. Because the Royal Assent cannot be divided; for the Words are, Le Roy, remerciant Ses bons Subjects: And their Lordships will have no real Advantage by going by themselves; this were no more than the Convocation do in granting Supplies to the King, which are enacted by the Lords and Commons. They say, That if an Assessment should be made again, which is very possible will be this Parliament, the Lords cannot be taxed distinctly, but with the Commons, as in all Assessments heretofore, and in this now levying." Then the Amendments concerning altering of the Dates were read, and postponed until the other Particulars were considered of. This House agreed with the Commons concerning the Charters. Concerning the Clause touching the Rating and Taxing of the Peers; for the better Consideration thereof, the House was adjourned into a Committee. The Lord Chamberlain reported, "That the Committee have considered of the Clause concerning the Rating of the Peers; and the Opinion of the Committee is, That the Committee for Privileges do meet on Monday Morning next, at Nine of the Clock, to consider of this whole Clause, and to report their Judgement to this House." Which the House ordered accordingly. ORDERED, That the Earl of Oxon, Earl of North'ton, Earl of Clare, and the Bishop of Rochester, are added to the Committee for Privileges. 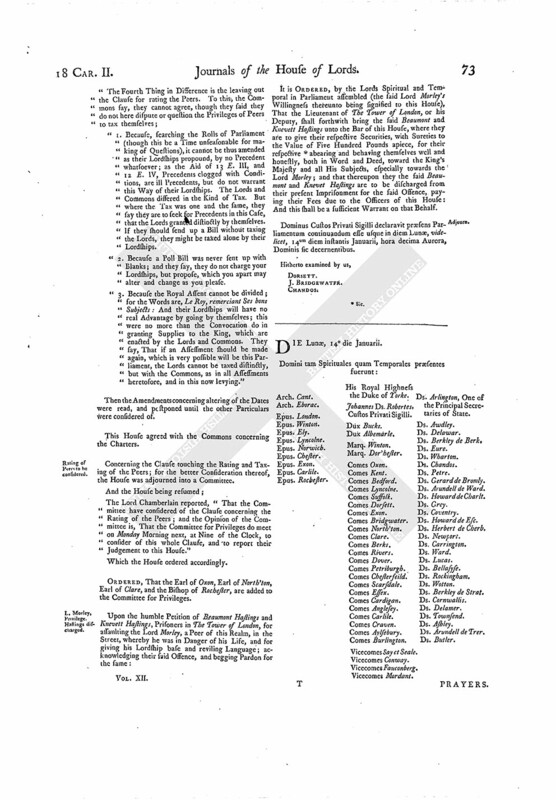 It is ORDERED, by the Lords Spiritual and Temporal in Parliament assembled (the said Lord Morley's Willingness thereunto being signified to this House), That the Lieutenant of The Tower of London, or his Deputy, shall forthwith bring the said Beaumont and Knevett Hastings unto the Bar of this House, where they are to give their respective Securities, with Sureties to the Value of Five Hundred Pounds apiece, for their respective (fn. 2) aberaring and behaving themselves well and honestly, both in Word and Deed, toward the King's Majesty and all His Subjects, especially towards the Lord Morley; and that thereupon they the said Beaumont and Knevet Hastings are to be discharged from their present Imprisonment for the said Offence, paying their Fees due to the Officers of this House: And this shall be a sufficient Warrant on that Behalf. Dominus Custos Privati Sigilli declaravit præsens Parliamentum continuandum esse usque in diem Lunæ, videlicet, 14um diem instantis Januarii, hora decima Aurora, Dominis sic decernentibus.